Looking after the family can often mean mums and dads are left doing all the little things that go unnoticed in the home, such as changing the empty toilet roll tube, especially when guests are around over Christmas. 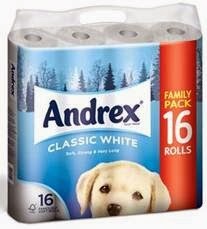 These tasks can sometimes seem thankless but to help ease the burden of changing an empty roll, the nation’s favourite toilet tissue, Andrex®, has reinvigorated its Classic White product and made each sheet of toilet tissue significantly stronger. This means each roll lasts even longer than before, so mums and dads can spend less time changing the toilet roll and spend more quality time with their loved ones over the Christmas break. To celebrate the stronger rolls, Andrex® is offering one lucky reader the chance to win a Christmas supply of Andrex® Classic White toilet tissue in its festive seasonal packaging. 1. One winner will be selected at random from all correct entries after the closing date 12.00am on 16/12/2013. 2. The prize will be delivered by courier before Christmas (25/12/13). 4. There will be no cash alternative and prizes are not transferable. 6. Entrants must reside in the UK. 7. Winner will be chosen by blog owner using rafflecopter which uses random.org after the closing date and will be emailed and announced on the widget. 8. Winner must supply a postal and email address which will be used only to send out the prize. 9. Multiple entries will be disqualified. Each sheet of toilet tissue is significantly stronger. Each sheet of toilet tissue significantly stronger, this means each roll lasts even longer than before. each sheet of toilet tissue has been made significantly stronger. each sheet has being made stronger significantly! Each sheet is significantly stronger. Each sheet has been made stronger. Made each sheet of toilet tissue significantly stronger. Each sheet has been significantly strengthened. Each sheet of toilet tissue is significantly stronger. This means each roll lasts even longer than before. Each sheet has been made significantly stronger. stronger. This means each roll lasts even longer than before. Each sheet has been made stronger..
Each sheet has been made significantly stronger!